Southampton defender Virgil van Dijk wants out of St Mary's. A RADICAL REFORM to the transfer window in England is to be proposed, and probably approved, by Premier League clubs next month according to widespread reports. It is believed over two-thirds of the 20 clubs are in agreement for the close season transfer window to shut a week before the campaign gets underway and not, as is the current case, on 31 August, a fortnight after it begins. Several top players are in dispute with their present clubs. 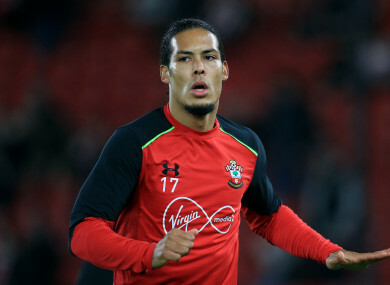 Southampton’s Virgil van Dijk is one such case with the Dutch international defender training on his own as several higher profile clubs chase his signature, while Icelandic star Gylfi Sigurdsson is another who is seeking a £50 million move to Everton. “There’s frustration here and I’m sure Southampton are frustrated, too,” Swansea manager Paul Clement said after his side had drawn 0-0 with Southampton on Saturday. “That’s why I think if the window is shut before the season starts everything is sorted out and we can get on with the football. The proposals would not affect transfers from Premier League clubs to foreign sides or vice versa, thus Diego Costa and Philippe Coutinho’s desire for moves from respectively champions Chelsea to Atletico Madrid and Liverpool to Barcelona could still go ahead. Influential agent Jonathan Barnett told the newspaper he doesn’t think the proposals would stop clubs making last day panic buys. “It makes sense and could make clubs more focused to do their deals early, but there will still be a deadline which creates panic,” he told the newspaper. The proposals are likely to be debated by Premier League clubs at a meeting in London on 7 September. Email “Premier League clubs set to vote on closing transfer window before season starts ”. Feedback on “Premier League clubs set to vote on closing transfer window before season starts ”.